My interest in the Psychological Understanding of Northern Mythology came through Personal Dreams of the Northern gods. 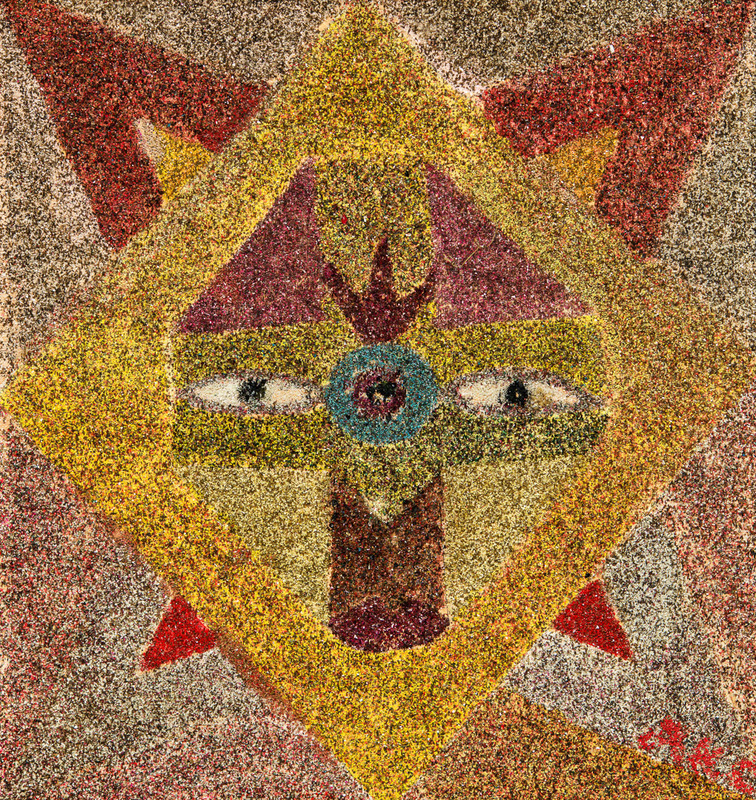 I purchased this sand painting from a gypsy in Stockholm, Sweden. Historically, the wolf has been the object of human hatred, misunderstanding and harassment, often symbolizing greed, darkness, savagery and the Devil. However, the stories of Myth, Indian tales and Folk tales have offered another view, i.e. the “helpful animal motif,” offering deep insights, exploration and explorations of Self. As a warm-blooded animal, the wolf is a close brother to man. This kinship offers a reflection of wild, untamed force. Teddy Roosevelt called the wolf the “beast of waste and desolation.” Fortunately, wolves are gaining greater ecological value. I would like to consider how his statement could offer an invitation to address mistreatment and lost wildness in ourselves. Myth has been called the oldest form of truth, religious truth expressed in poetical language. Nordic Mythology especially expresses the courage and spirit of man against the remorseless powers of fate. The world of their Gods was Asgard, located under the first root of Yggdrasil, the World Tree. Here bubbles the sacred well of Urd, tended by the three Norns. You will hear three worlds mentioned in the story – Jotunheim, land of the Frost Giants, home of Loki, where the fountain of wit and wisdom will be found; Nifleheim, the mist realm of cold and darkness, where the Serpent Nidhog gnaws away at the root, and Svartalfheim, land of the Dark Elves. Loki and the giantess Anguish-boding had three monstrous offspring, born and bred in Giantland. The eldest was the wolf, Fenrir. The second was the Midgard Serpent, and the third was a daughter called Hel. Even in a crowd of a 1,000 woman, Hel’s looks were quite likely to single her out – the upper part of her body was all pink; from her hips down every inch of her skin looked decayed and greenish-black. Her expression was always the same, gloomy and grim. “Their mother is evil,” said one. “But their father is worse,” said the second. “Expect nothing from them but the worst,” said the third. And so, the Gods agreed that Loki’s children must be captured. At Odin’s command, a group of Gods crossed into Jotunheim (Land of the Frost Giants) by night. They burst into Anguish-boding’s hall and gagged and bound her before she had even rubbed her eyes; then they kidnapped her children and carried them back to Asgard. As for the Serpent Nidhog, Odin was in no doubt as to what should be done. He picked him up, hurled him into the ocean surrounding Midgard, the world of men. The serpent hurtled through the air, smashed into the iron face of the water and sank to the sea bottom. There he lived and there he grew so thick and so long that he encircled the whole world and bit his own tail (Uroboros—the dragon eating its tail; symbolically, the cycles of the eternal return). Odin was just as sure what to do about the serpent’s sister. He took one look at Hel and hurled her out of Asgard, too. He threw her into the darkness of Nifleheim (the mist realm). As she fell, she heard Odin’s decree that she should have dominion over all those in the nine worlds who died of illness or old age. 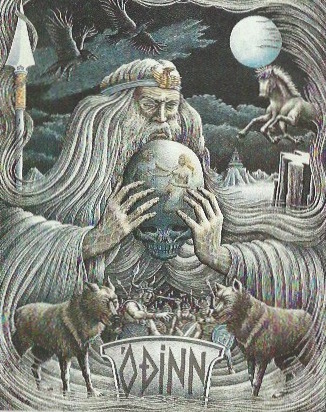 Odin, having two wolves of his own, thought it would be best if the Gods themselves kept an eye on Fenrir. He seemed no different than any other wolf and all the Gods agreed that there would be no harm in letting him roam around the green and golden fields of Asgard. 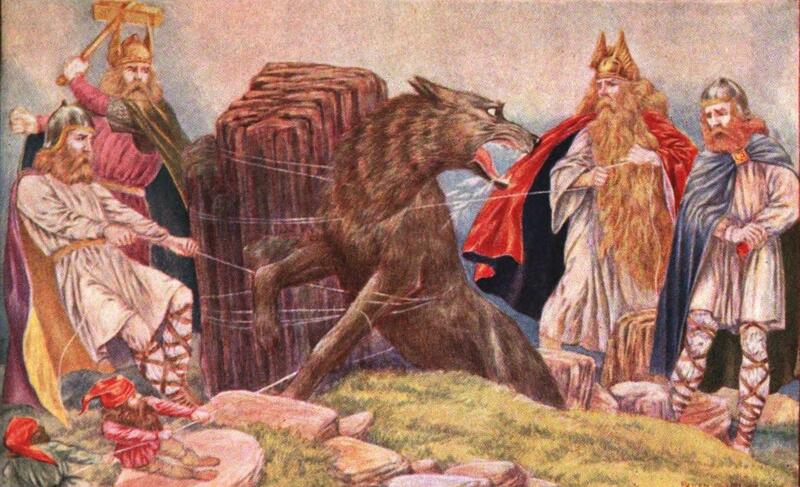 Even so, Fenrir’s only contact with the Gods was with Tyr, brave Son of Odin, who would meet the wolf at mealtime. The Gods were quick to change their minds about Fenrir, however, when they saw him growing larger day by day. And when the three Norns renewed their warnings and said that the wolf would cause Odin’s death, the Gods’ alarm became far greater. Because they did not want to kill the wolf and stain the sanctuary of Asgard with his evil blood, the Gods agreed they must fetter him instead. They made a powerful chain of iron links they called Laeding. 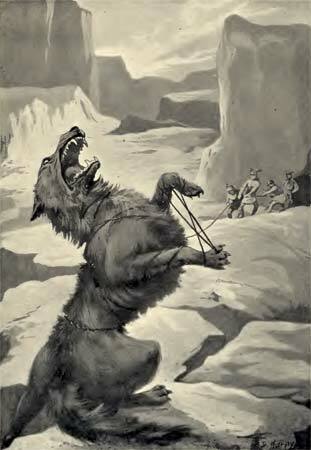 Resolving to catch Fenrir, the Gods playfully challenged him to try his growing strength. The wolf inspected Laeding, saying, “It’s very strong, but I’m certainly stronger!” and he let the Gods wind the chain around his neck and body and legs. “Finished?” snarled the wolf. He planted his massive paws well apart, filled his lungs with air, and then flexed every muscle in his body. Laeding’s links at once sprang apart and the Gods jumped back in awe. The Gods lost no time in making another chain. This one was called Dromi and was twice as strong as Laeding. The links were larger than those of the largest anchor chain. No man could have even moved them. Fenrir looked at Dromi. He thought it looked immensely strong, but then, he thought that he, too, had grown even stronger since he had snapped Laeding. “No one wins fame without taking a risk,” was all he had to say as the Gods bound him as before. Then he shook so that there was a terrible clinking and clanking and grating. He rolled over and arched his back and banged the chain against the ground. He tightened his muscles until they were as hard as the iron links of Dromi. He stood up again and dug his paws into the earth and strained – and, all at once, Dromi snapped. The shrapnel flew in every direction. After this, the Gods were very frightened, and despaired of ever being able to bind Fenrir. A messenger was sent off to Svartalfheim, (world of the dark elves, one of the 9 worlds in Norse Mythology). Down he went under Midgard through gloomy, dank, twilit grottos. There he found Nar and Nain and Nipping and Dain and Bifur and Bofur and hundreds of other elves, each one as horrible as the next. He promised them gold and more gold if they would make a fetter for Fenrir. The dwarves’ eyes gleamed like glow-worms; they whispered and schemed and set to work. They soon made a fetter as smooth and supple as silk ribbon and they called it Gleipnir. The Gods looked at each other in silence – all were wondering what to do. Without hesitation, being the most courageous, Tyr put his right hand in Fenrir’s mouth. Quickly, the other Gods wound Gleipnir round and round the wolf’s neck and body and legs. Fenrir began his struggle against it. He kicked and shrugged and shook and jerked and rolled; but, the more he strained, the tighter Gleipnir became. Suddenly, he snarled and clamped his teeth. Tyr, bravest of the Gods, twisted and cried out—he had lost his hand. The other Gods knew that Fenrir was bound at last. The Gods hastily fixed a large chain to the end of the silken ribbon. Passing it through a hole in a huge boulder, they secured it to itself. Then they drove the boulder a mile into the earth, and secured it to an even larger stone. Fenrir continued to shake and wrestle, grinding his teeth, gulping and straining his blood- stained jaws. In his violent efforts to break loose, he tried to bite the Gods. Seeing this, one of the Gods drew his sword, driving the point hard into the roof of Fenrir’s mouth, ramming the hilt against the wolf’s lower jaw. Fenrir was gagged and bound. His howls were terrible and slaver streamed from his jaws, running from the middle of the island into the lake, forming Von, the River of Expectation. And so, just as the Midgard Serpent waits at the bottom of the ocean, coiled round the world, and just as Hel waits in Niflheim, surrounded by corpses and swirling death-mist, so gagged and bound Fenrir lies and waits for Ragnarok. (natural disasters and submersion of the world in water). Most of us have an incapacitated wolf in ourselves somewhere, a bound vital force buried in the paradox of expectation. The redemption, rescue and recovery of the resilient energy hidden here is a serious invitation to live in vitality and wholeness. The myth tells us the wolf is the result of a union of a giant’s trickery and anguish. Von Franz views giants as “sheer psychic emotional libido.” If this energy can be awakened to, i.e. if awareness of complexes can occur, be related to consciously, with recognition of the cost of their autonomy, new ego/Self libido for courage can become available. Today we’re going to review only one of these monsters – Fenrir, the wolf. Lying, cheating, manipulating, being fickle, deceitful, cunning, fraudulent, malicious, spiteful or contriving; thieving, greediness, insatiability at any level, dissatisfaction, being resentful and argumentative – that tendency to growl or bite – the howling of the bound wolf. Just as wolves occasionally prey upon sheep and other livestock, so does the inner wolf prey upon levels of domestication in ourselves. Here is an Aesop’s fable that speaks directly to this issue (p.254-Lopez). If the wolf within is not free, what it could potentially and authentically supply for you is then expected from others. It is clear that the Gods’ reason for binding Fenrir was their fear – fear of disruption to their present view of the peace and harmony they created in their cosmic order – their Garden of Eden. Could this be a place of unreality in ourselves that wants life to be always smooth, content, harmonious, without conflict or bleeding. The habit of continuing to fear is easily held on to and, once established, is challenging to overcome. We are generally most afraid of that which we least understand. Von Franz comments that most evil springs from unhappiness, fear of life and disappointment or being swept away by one-sidedness. One dreamer’s psyche put it this way, “I’ll have a ‘smoothie.’” (We’ll hear more about this dream a little later). Despair comes when the wolf insists on breaking loose, disrupting our naïveté and unconsciousness. Remember, the Gods actually wanted him to roam free amongst them. With the third attempt at binding, something in the wolf is awakened. The challenge of the silken ribbon looks too easy, and he begins to suspect that some trickery is about to be played upon him. As a result, Fenrir asks for equal risk from the Gods. After much silent deliberation, a sense of respect arises in Tyr for this wildness. (Tyr is the god of Law and Justice). Does his courage consider and weigh the probabilities and cost of acceptance of the risk of conscious sacrifice? Choosing to meet Fenrir’s terms, does he consider the possibility of co-existence as actually possible? It seems he is willing to trust and try some new way of being. The willingness to take on conscious sacrifice will incur real suffering. There may be felt loss , injury and death to other parts of ourselves that would agree with binding the wolf. Tyr had been willing to feed the growing Fenrir. How does one come into relationship to the inner wolf? Where can wildness live in oneself? 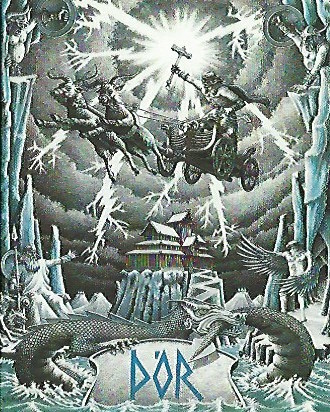 Except for Tyr, with the final binding of Fenrir, the rest of the Gods became self-congratulatory and it appears they stay there until the end chaos of Ragnarok, when a new order of consciousness is to be established. Please consider how this attitude might look in yourself. Could it be continuing self-betrayal of the authenticity of our original nature and structure that contributes to the binding of wildness – whatever form it may take, whether it is avoiding social disapproval, necessary isolation, negative emotion, maintaining too great a concern for self-image, ignoring the call of the majesty of life or the messages from the body, even not eating or exercising consciously–all ignoring what serves individual vitality and necessary care of the spiritual vehicle, the body. The more such behavior persists, like the wolf struggling against Gleipnir, the more a person becomes entangled by his personal lies and self-deception, avoiding the invitation to integrate/transform a new understanding of ruthlessness into the perseverance of individuation and creativity. When one consciously or unconsciously binds the wolf within or ignores or crafts a desperate, illusion-based deal with the instincts of one’s animal nature, the creativity of one’s inner dwarves and spirituality are misused and misdirected. Such a relationship with the dwarves results in binding the wolf/vitality with deception, intrigue, plotting, craftiness and magical thinking. This is very costly. It costs us our own unique, authentic creativity, given only when we are in personal, right relationship to wildness, nature and our inner dwarves. When we are in appreciation and right relationship to the unconscious, these energies are free to forge their gold and bring forth wisdom. Let’s consider what gifts the wolf might bring if left free in us. Wolves in the wild prey only on weakened animals, the old, the diseased and only those young animals, such as caribou, who are unable to outrun them. Wolves are also carrion-eaters. Consider the authentic, trustworthy cycles of nature operating here. Could we trust what needs to die in us—outmoded patterns, ideas and structures? Odin took two wolves with him to the battlefield and wolves are well known to be companions of witches and goddesses, (medial aspect of the feminine), thus his desire to allow them to roam free. Could this be allowed in oneself? There is an innate alertness in the wolf to incapacity and wounding that is a real contribution to our inner ecology. Left unbound, the wolf naturally devours or eliminates those parts of ourselves that are weak, decayed, sick or of doubtful potential, that need to die in a timely way. Such deaths have dignity and are not tragic. In other words, the wolf’s fierceness, which may seem merciless to some parts of ourselves, can become the necessary firmness and iron determination that is needed if there is a tendency to indulge in sickness, or where there is not possibility of evolution, or where a patterned, chain reaction such as suicide or revenge is going on and must be stopped, or at other crucial turning points in our lives. Von Franz has likened this to the decision of the surgeon who cuts off a limb to save the rest of the body. Detachment and objectivity are not possible without giving up ego expectations and manipulative power. Wolves mate for life. They are instinctively loyal. This brings up the invitation and ability to be fiercely loyal to one’s authenticity and to one’s inner spiritual archetypal demands. The collective use of the term “wolf” for the philandering male, is an example of projection of human qualities onto the wolf. One can become a hungry wolf seeking inner spiritual demands, wildness and vitality through others. The wolf is extremely alert to the smallest changes in his world. In your inner wolf is the discerning ability to see things as they are – without illusion. An example of this might be felt as a surprise to possible, unexpected instruction, as Von Franz puts it, “from the dark side, such as a voice that counsels, “Beware of your brother.” Mostly, it is a voice that counsel’s caution or speaks of alternatives that one would not usually have considered; mostly it will advise what not to do. The wolf’s ability to be there without being seen speaks to a correct level of elusiveness and solitude for an individual, often not used or appreciated enough by most of us in this extraverted culture. The grim, negative, hidden rage image that has been carried by the wolf also has its positive side. Von Franz speaks of a “holy rage” that is determined to restore order and bring balance to a situation, for example, Christ’s rage at the moneylenders in the temple. The norm is more to bind the wolf than to allow him the freedom to function naturally in us. It requires the continual choice of remembering to pause long enough to listen for his counsel. This will mean a surrender of habitual reactivity and a sacrifice of magical thinking, contrivance and control of others. This level of trust in one’s own nature requires a profound level of attention and courage. I am grateful to one of my clients for her permission to share the following dream. The parts of oneself that are ready or not ready to take the jump into the seriousness and commitment of individuation, i.e. to begin to include the unconscious —perceptions from our dreams, our body, synchronicity and intuition. Addressing reluctance to go on the journey, a need to stay in denial or the challenge of right timing. The realization of the cost of this new way and the energy it will take. This inner journey may not be timely for some individuals. More ego development may be required, or it simply may not be in the person’s destiny to jump in at all. I have observed that, either way, once any individual has made a serious commitment to some personal , meaningful , creative field, artistic exploration and pioneering can begin and they can be on their way into life. Integration of the wolf energy requires all of us. The dream indicates that the jump into the inner journey is not yet timely or possible for this person. The many projections on the wolf have cost humankind more than is realized, for in projection there is always a loss of soul. One becomes less alert and gets in one’s own way. Only as the human can return to compassion for the personal, pioneering journey one is uniquely called to live, only as one is boldly willing to understand and participate in the dignity of life and death together, to address the majesty of his nature and the mystery of all life, can the gift and integration of the wildness and integrity of the wolf in oneself be honored and lived authentically. May we not be at odds with the universe, caught in inflation or be without courage. Source materials: Barry Lopez, Farley Mowat (Never Cry Wolf), Marie Louise Von Franz, Northern Myth, Robert Bly (Iron Hans) and Jonathan Young, The Center for Story and Symbol. Personal communication with Betty Smith, Mythologist.